Remember, remember the 5th of November….! Well, the month of November literally started with fireworks, well maybe not in Egypt but I am sure where ever you were you had a good bonfire night! As the old phrase would go “Remember, remember the 5th of November….” Unfortunately for us we don’t remember, as we have once again been very busy teaching, guiding, guiding, teaching and filling tanks!!! Starting this time in Sharm we welcomed Jaana Nystrom who came out to make her TDI Advanced nitrox course with Sarah. Jaana came out with her son and friends who were also making some days of recreational diving. Unfortunately Jaana had been very busy in her work before she came on holiday and decided that she needed more “chill time.” After having an introduction into twin set diving, Jaana continued with some dives with the family. Hopefully Jaana will return to us again when she has more time and can relax to complete her course. We wish you all the best Janna. friends and clients of Red Sea Snapper, a specialised photo operator. Duncan Spencely and Steve Parry took them through their paces when they were completing their PADI Tec courses. 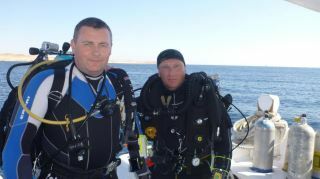 They finished their courses with dives around Dahab, where a certain instructor may have flooded his dry suit!! We wont mention how it came about that the suit was flooded but I think that a certain individual brought Duncan a few beers! Well done to all three and I am sure they will be back for some more! Heading back over to the mainland we welcomed John Miles. John who is a fully qualified trimix CCR diver on his Megaladon, came out to make a week of Trimix CCR diving before heading out with us on a technical safari. John, a very relaxed character had dives with Shaun and myself all around the Hurghada area gradually increasing depth ready for deep dives on safari. remember. I actually was only an instructional assistant when he made his first TDI courses!! John was back to make the BSAC Advanced Mixed Gas course with me. John is such an organised and meticulous character and it certainly shows in his diving style. 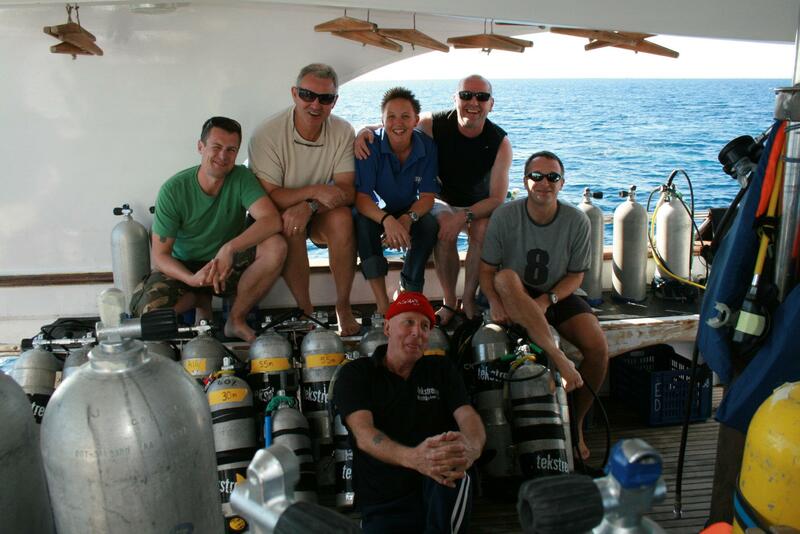 After a week of diving together, John passed his course and can now make deeper mixed gas dives all over the world. Once again John it was such a pleasure to spend the time with you. Road trip style up I came to El Gouna, not on my own but also bringing tech guide Shaun, newly qualified PADI Tec 45 diver mark Hewitt, BSAC mixed gas diver in training John Hunt to come and take the boys on a tech dive on the wreck. The conditions were fantastic, good visibility (for the wreck! ), very little current and not another boat in sight. Happy diving days. Soon after Aude left us, we saw the return of Andrew Grundy. Andy has been diving with Tekstreme since his very first PADI Tec 40 course early last year, and it was quite fitting that he has now made his final PADI trimix course also with us. Well done Andy it has been great to be able to take you through the levels and see you come out the other end as an established safe technical diver. I hope soon that I get chance to dive with you, as it seems as though I am the only one who has not yet! We have literally just got back from our northern technical safari. On board were; Erik, Christian, Andreas, David, Florin, Claire, John, Csaba, Stella, Rohan, Susan, Maria, Russell, Shaun, Louise and Simon. It was a bit windy to start with but calmed down by the end of the week. Dives that we made included; Rosalie Muller, Shark & Yolanda Reef (no comments from anybody about why I did not see the toilets! ), Thomas Canyon, the wreck of the Lara, Jackfish Alley, Abu Nuhas, Small Giftun Wall, the Gulf Fleet wreck and many more shallower reefs. 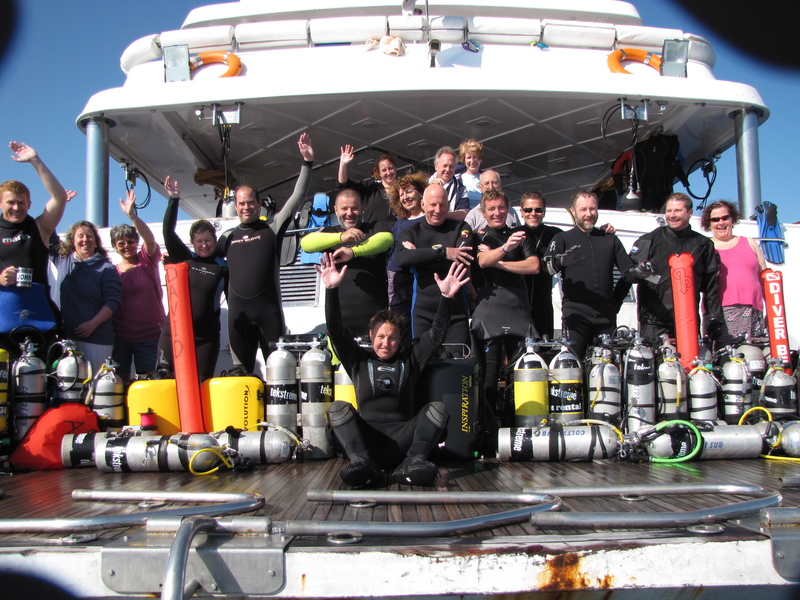 A good time was had by all and many successful dives. David was kind enough to get some video footage of the Lara and has made a small clip for all to see. You can see it by heading to http://www.youtube.com/watch?v=PL0_CJdl6n4 Many thanks for that David. And so as we draw toward the end of the month we take a deep breath and get ready to begin all over again In December!!! Cat & the Tekstreme team. Who has time to think about Christmas! ?